Get a jump-start on holiday decorating with these shimmery miniature pumpkins. 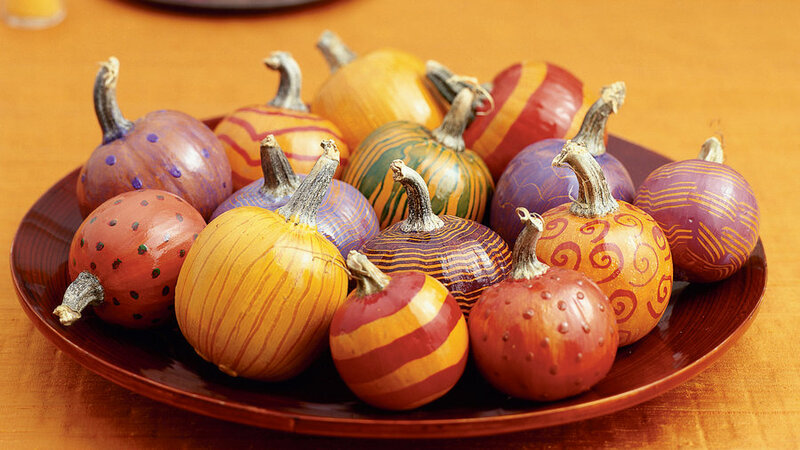 Tiny pumpkins ― or any small gourds ― can be colored in minutes with acrylic paints or permanent markers. The secret to their jewel-like sparkle is a finishing glaze applied after the paint or ink has thoroughly dried. Display the decorative pumpkins in a pretty bowl on a coffee table, use them as a centerpiece on the dining table, or nestle them with seasonal greens in potted plants. You can even use them as place cards, setting them on individual plates with name tags attached to the stems. 1. Use a foam brush to apply acrylic paint evenly over pumpkin. 2. While paint is still wet, run a rubber comb around the pumpkin. Start from the stem and work from top to bottom. As an alternative to painting and combing, use a broad-tip marker to draw spirals or dots on the pumpkins, or go a little wild by drawing random lines in contrasting colors. 3. When paint or ink is dry, spray with a polyurethane glaze as a protective finish.